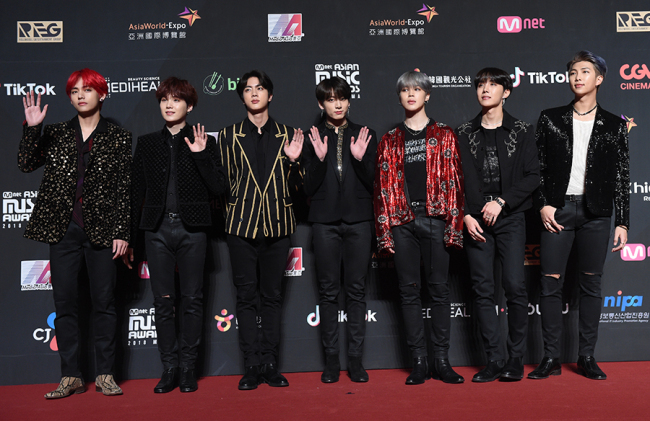 Global K-pop sensation BTS has topped a national survey on the best music acts of the year. Gallup Korea announced Tuesday that the seven-member boy band earned 24.4 percent of support in a survey on South Korea's top recording artists for 2018. Gallup polled 4,200 South Koreans between the ages of 13 and 59 from July 4-22, Sept. 7-27 and Nov. 7-30. It has a margin of error of 1.5 percentage points, with a confidence level of 95 percent. Participants were asked to pick their three favorite artists. Girl group TWICE ranked second in the survey at 11 percent, followed by female singer-songwriter IU at 10.2 percent. Answer" in September. BTS is the first K-pop act to reach No. 1 on Billboard's main albums chart. "Fake Love," a gold single off "Love Yourself: Tear," peaked at No. 10 on the Billboard Hot 100. The group's recent albums have spawned several other platinum and gold singles that topped Billboard's world singles chart.